Installation, replacement and rehabilitation of 8" to 18" trunkline sewers. Construction of various surface improvements including pedestrian ramps, asphalt overlay, curb and gutter, sidewalks and slurry sealing. There was 910' of 18" jack and bored sewer placed within a 36" steel casing. 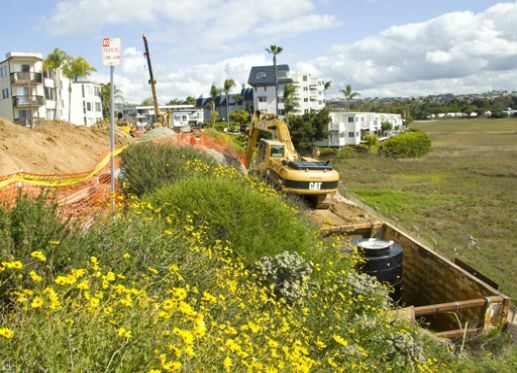 The work was over 20' deep in groundwater and directly adjacent to the San Diego Bay. The jack and bore consisted of 4 runs and utilized 4 large bore pits that required 24 hour traffic control and dewatering. All work was done in tight residential streets near a sensitive habitat.